I have a confession. I suffer from mom guilt. Ever heard of it? It’s that little voice that reminds you that you should be doing more. Spend more time holding your baby. Be more fun and present. Read more. 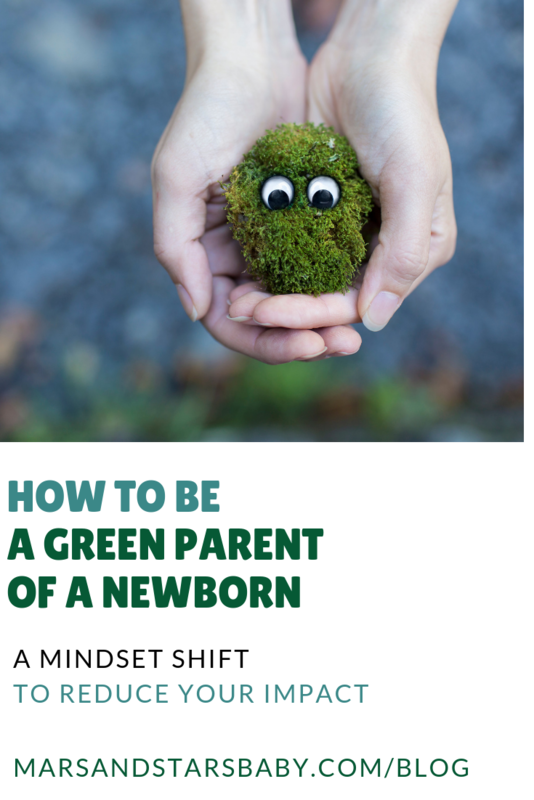 Lately, it’s been telling me to be a more green parent… And I think that voice is right. As the saying goes, no one can do everything, but everyone can do something. With the arrival of a new family member, you might be eager to make changes and to preserve the world for your little sunshine. On the other hand, you might also dread the idea of complicating your everyday routine. So where do you start? Start with a mindset. Being a green parent is not all-or-nothing and it’s not a competition. You don’t have to overhaul your life, you just have to learn to be mindful. Our philosophy for being green is to reduce what we use. Manufacturing, transportation, and disposal of products has a huge impact on our world from the exorbitant use of energy and resources to water and air pollution. We propose that new parents start by being mindful of what they use, what they need, and how their actions impact the rest of the world. Then, in your own time, start taking opportunities to change your impact. Here are four tips to help you be a green parent. 1 – The greenest product is the one you didn’t buy. This phrase (attributed to Joshua Becker – author of Becoming Minimalist) serves as my mantra when I’m tempted buy all the cute baby things. Why do our homes suddenly become a miniature Babies-R-Us store? Well, for one, baby things are pretty irresistible, and mom’s nesting instinct doesn’t help. Another reason – many of us don’t really know what we’ll actually need, so we stock up on things that seem useful or popular. And – gifts. Understandably, everyone wants to show their love for your little one with a little something special. No one seems to be immune. Baby soap, shampoo, oils and lotions – for the first six months I used nothing but water and a soft cloth on my baby’s skin. If she had a diaper rash or dry skin, I used a little coconut oil. Lots of newborn clothes – To our dismay, babies grow out of the newborn clothes really fast. They may not even get a chance to go through their entire wardrobe before getting too big. If you really must have a little fashionista, just wait a few weeks. Snowsuit – I actually ended up buying one as my baby was born in a cold time of the year – BUT it turns out that babies shouldn’t wear anything that bulky in the car seat! Who knew! To keep my baby warm on walks, I ended up baby-wearing her under my coat which kept her body temperature in a perfect state. Otherwise, we just bundled her in blankets. Change table – okay some people will disagree, but many parents end up just changing their baby wherever. All I’m saying is consider it. If being minimal doesn’t sound like a realistic option for your family, the next best thing is to buy second-hand. Become a regular on parenting Facebook groups, Craigslist, kids’ consignment stores and thrift shops. Remember that green parents want to reduce the manufacturing burden on the environment, and buying used items means fewer have to be produced. You’ll likely get a really good deal as many parents are desperate to get these things out of the house. There’s a good chance you’ll even get your money back by selling these items once you’re done with them. And lastly, you’re less likely to suffer buyer’s remorse. Bonus points if you can trade baby things back and forth with a friend. Personally, I made it a mission to buy everything used (with a few exceptions.) It was like a game that required strategy, time, and creativity. It was fun. If you’re hung up on the fact that these items aren’t new, I don’t know… I kind of liked the fact that they were loved and cherished by someone before me. Besides, these things were only used for a few months. Here is a list of the pre-loved items I bought: stroller, crib, bottle sterilizer, change pad, blankets, baby carries, bunting bags, crib sheets, car seat mirror, baby monitor, baby bathtub, and even cloth diapers! For things you really can’t buy used, consider having a baby registry so that your loved ones can give you exactly what you plan to use. I know it’s not for everyone, but I would encourage you to at least look it up. And remember that it doesn’t have to be all-or-nothing, many cloth diapering parents use disposables for going out or during the night. Disposable diapers not only add to our landfills, they also require a lot of materials, water, and resources to manufacture. You can also be a super frugal and super green parent by buying your cloth diapers second-hand. If the thought of that grosses you out, just read through the thousands of forums on the topic. They honestly come out perfectly clean. Another thing you can try is a diaper service in your area. The service gives you a pile of clean diapers for the week, then picks them up at the end of the week to wash them. Easy peasy. WHAT DOES THIS EVEN MEAN? Many big-name companies with questionable environmental practices pander to our desires to be green parents. It’s really hard to know until you do a little research. One thing to be mindful of is the use of disposable products or products with a lot of packaging. I recognize that sometimes convenience and cost win, but it’s still good to pay attention and look out for alternatives. Also, start learning about the ingredients in your household products. I use baking soda or vinegar on pretty much every surface of my home, and look for biodegradable products for the things I can’t replace. Take time to research some ethical and sustainable companies that you’d be proud to support. We can each find our own way to reduce our impact on the environment. It’s not a competition, it’s not an all-or-nothing game. Start being mindful of where you can make changes that your children will thank you for. Wait wait! While you’re here, check out The Breezy Wrap – babywearing. sweat-free.